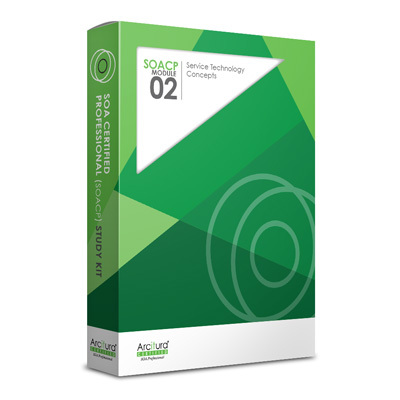 This Study Kit contains the complete set of course materials for SOACP Module 02: Service Technology Concepts. This Study Kit further includes a number of additional supplements and resources designed to support course completion and exam preparation via independent self-study. Also included are eBook versions of the SOA with REST: Principles, Patterns & Constraints for Building Enterprise Solutions with REST and Web Service Contract Design & Versioning for SOA text books from Prentice Hall. For more information about this Study Kit, visit the SOACP Study Kit 02 page. Also available are optional add-ons for the purchase the associated exam voucher and eLearning Study Kit. The exam voucher add-on is for a pre-paid Pearson VUE voucher for Exam S90.02B, discounted from $150 to $100 USD. The SOACP eLearning Study Kit 02 add-on provides on-line access to course materials and media content.